Searching for beetles among decaying wood can be frustratingly unproductive unless, from the start, some thought and method are applied to the process e.g. lifting delaminated, dry and powdery bark will soon prove to be pointless because other than providing a shelter for over wintering species such as ladybirds and a few ground beetles (etc.) it is a poor habitat in terms of nutrition or protection for developing or feeding insects in general. Similarly, looking under logs in woodland can be disappointing although many species not necessarily associated with wood e.g. carabids and staphs may turn up in numbers. This introduces several questions central to any discussion on recording beetles from wood; firstly, what beetles are likely to be found when searching wood? Secondly, what beetles should we expect to find when searching wood? And lastly and perhaps most obviously, how do we go about finding some of these species? The first question is complicated because the species occurring on or around or within a tree stump or a log (etc.) will depend upon a great many factors but among the most obvious, and among those most easily recognised in the field, are the degree of decay and condition of the sample and the surrounding environment. What beetles are likely to be found depends at first, until we know how to go about things, on how we look for them. Many species may be found that are not associated with wood and so there is an element of luck involved; using ground beetles as an example, there are a few species that are associated with wood and, while they may be found generally while dispersing, if we want to record them we need to search this habitat. Examples of such carabids include Dromius species and Ocys harpaloides; over the years we have found Dromius meridionalis under loose Elder bark on many occasions and this habitat would be, for us, the first place to look for the beetle should this habitat be available. These species are associated with this habitat but there are many other carabids to be found under bark or logs that are present simply because it is expedient; species of Notiophilus, Nebria, Pterostichus and Carabus (etc.) will often be found in these situations and we have found Carabus nemoralis deep within the soft decaying heartwood of Salix and Fagus stumps in widely separate localities. A habitat may host a species of beetle for some reason indirectly associated with wood and such species will not be exclusive to this habitat e.g. Cychrus and Silpha feed on snails and these are common under logs in damp places. Searching around the surface of wood can be productive for all sorts of beetles not actually associated with wood both during the day and, more particularly, at night. In this way we found Stenolophus skrimshiranus crawling across a mat of thick moss on a birch stump in Cassiobury Park one night, such activity is a bit hit and miss until some experience is gained, more of this later. So the question as to what beetles are likely to be found when searching wood is open ended and we should have to produce a pointlessly long list of species to cover all eventualities. With experience we learn to approach a sample, e.g. a standing trunk or a log pile, as stealthily as possible so as not to startle anything and to visually search as soon and as carefully as we can. Turning logs is better done by two people who have experience of working together and who are both aware of the possibilities. What turns up is to some extent a matter of luck but also experience e.g. a log lying among many others in deep shade on leaf litter some distance from a wood margin is very unlikely to be as productive as one lying beside a woodland path which is warmed daily by the sun, and a solitary log lying out on moorland is probably more attractive to the coleopterist than one among many as it will be a more sought after, if probably a bit crowded, place to shelter for all sorts of animals. Wood can be used to attract all sorts of beetles e.g. placing branches or logs in a pond is a good way of finding Haliplus (etc. ); left for a week or two at any time of the year the beeltes may, if present in the particular site, be found on the wood surface. 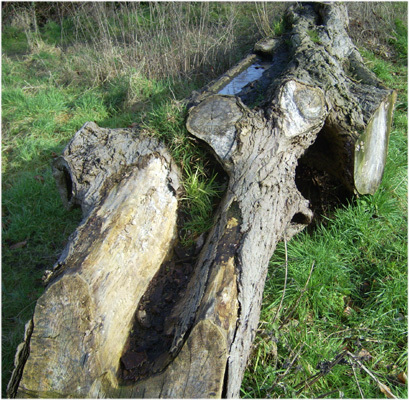 There are many other habitats associated with wood that will attract beetles e.g. insect or bird nests, ivy, grass tussocks and other vegetation growing on or around a wood sample and these will always be worth a look. Such considerations generally apply to adventitious species that are often as likely to be found under a pile of discarded newspapers or an old tyre as they are under a log. By providing a sheltered habitat for many adventitious species the many products of death and decay associated with wood are of course attractive to the coleopterist but beyond this there is a group of beetles, of many and varied families, that are in one way or another intrinsically associated with wood decay and its products and these are referred to as saproxylic. For the coleopterist working with wood these are the generally the most interesting species to be found in this habitat. The second question mentioned above i.e. what species are likely to be found (generally) when searching wood can now be answered in a trivial way because much has been written on the subject and many species have been listed. 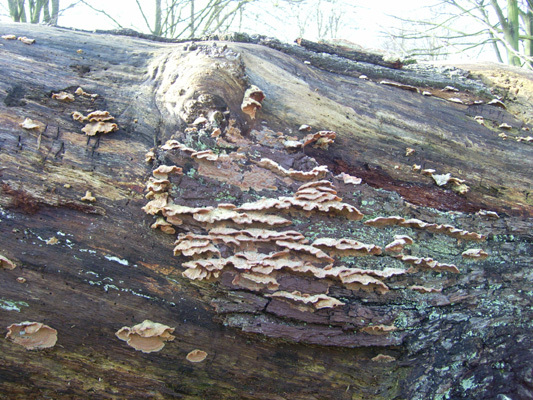 The term carboxylic, has been variously defined; first used by Speight (1989) to include species of invertebrate that are dependent, during some part of their life cycle, upon the dead or dying wood of moribund or dead trees (standing or fallen), or upon wood-inhabiting fungi, or upon the presence of other saproxylics, and later modified by Hammond and Owen to include decay (etc.) 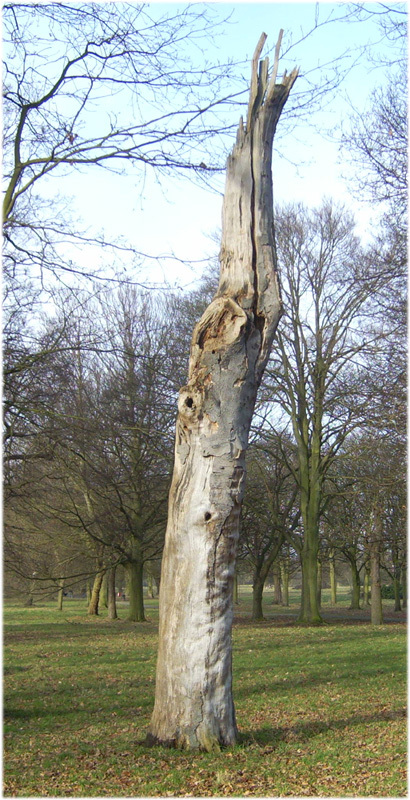 present on healthy trees: species that are dependent, during at least some part of their life cycle, upon dead or dying wood of usually over mature, damaged or dead trees (standing or fallen), upon wood inhabiting fungi, or upon other species associated with this habitat. In any case, quite apart from finding a wide range of adventitious species or species associated with habitats peripheral to wood, we should expect a range of saproxylic species of coleoptera, and these are listed, along with much interesting information, by Alexander. These species have over recent years been used to assess and rank woodland and parkland habitats in terms of biodiversity and importance for conservation by the use of a saproxylic quality index (SQI) and a good introduction to this fascinating area of study is given by Fowles, Alexander and Key (1999). This paper also provides a list of the British species, along with scores, currently recognised as saproxylic and we now summarise this by family, along with the numbers saproxylic species included, to give an idea of how broad an area for study this fauna can be. The list of species considered as saproxylic may vary e.g. there are species in Alexander that are not on the above list but, considering the above definitions, it is easy enough to appreciate why the various species are included. Nowadays an appreciation of the rationale behind the SQI is central to understanding, in context, how and why various wooded habitats are valued as they are. Such an understanding will also allow coleopterists to assess local sites and so get an idea of how things stand compared with nationally notable sites. A list of rated sites is given in the above paper. This subject really ought to be pursued by those interested in their local fauna and we intend to include a discussion on the subject on this site but for now we are more concerned with offering advice about how to find some of these beetles. At some time or other, generally during warm days or evenings from March onwards, the adults of most saproxylic species will break cover from within their habitat in the wood and become active. The opportunity should therefore be taken to look for some of these active beetles and this is a simple procedure requiring nothing more than patience and a keen eye. The surface of standing or fallen timber should be examined very carefully as there are some very small and fast moving, and therefore elusive, species e.g. Bitoma or Scaphisoma spp. Others may sit and bask in sunlight e.g. Conopalpus or Megatoma, while others might be busy in large numbers trying to find a mate e.g. Ptilinus or Tillus. The habit of taking time to look carefully along the flanks and around the tops of standing, damaged or decaying timber will soon pay off as many species may be found in flight above or around the body of the host. This is an acquired art which may take a while to master but eventually, after looking at enough timber, likely hosts will be spotted a mile off. In favourable weather any vegetation, arboreal or otherwise, adjacent to a likely host should be swept or beaten and nearby flowers, especially umbels, examined. Platycis minutus may thus be found in late summer swarming on vegetation around likely hosts in sunlit positions. Looking at flowers along wooded borders is the easiest way to find longhorns. During spring and summer it is worth looking under bark as many saproxylic species may be found in this situation e.g. the fast moving Uleiota, all the better if the wood is hosting fungi, is occasionally warmed by the sun or if you are searching near the junction of healthy and dead wood or bark, in this way a range of species may be observed. Some of these it will be noticed are superbly adapted for this environment e.g. the dorso-ventrally flattened Uleiota, Silvanus or Pediacus. Applying the same methods of patient observation at night will be equally, if not more, rewarding as many e.g. Prionychus or Prionus are only active at this time. This procedure can be made more interesting by using sugar or other baits as lepidopterists do and in this way we have found many Histerids and Staphs. To better appreciate the local saproxylic fauna it will be essential to employ a few specialised methods to find them and the first of these, i.e. sweeping, has already been mentioned but it is worth refining the idea a little as the process can be made more versatile, and so more productive, with a little imagination. Large, purpose made sweep nets are available from most entomological suppliers but these can be cumbersome and a white bag on a twelve or fourteen inch frame is often more versatile. A spring frame net of this size can be useful as it can be pushed against a trunk while material above is collected. Sweeping generally consists of dragging a suitable net through the host foliage as well as any other foliage in the immediate vicinity. Similarly, beating low branches over a white sheet spread on the ground below will dislodge beetles and make them available for inspection, a refined and more versatile method is to use a beating tray with a stick to tap branches but a net will do just as well. Literally sweeping the area with a dustpan and brush can be a very productive method for obtaining saproxylics; thus the surfaces of timber can be sampled for visual inspection in the field or the debris samples from around damaged or fungus ridden wood taken for more thorough inspection inside. Grass and other short vegetation growing around trunks or on or around logs may also be swept with good results; use a fairly stiff brush and sweep a small area vigorously into a dustpan, a net held obliquely in front of the brush is better. If two people are doing this the best method seems to be to sweep directly into a sealable polythene bag, once sealed the samples will be ok for a few hours and, sealed, they can go straight into a fridge for later examination. This method is likely to generate a fair number of samples (and beetles) and it is unlikely that these will all be dealt with in an extractor in the time available so a method we use might be worth mentioning. After an hour or so in the fridge we remove the sealed bags, lay them flat on a white surface and cut around three edges so that the two sides can be opened and laid flat and the sample exposed. We then illuminate the sample with a hot, powerful spotlight, generally of around a hundred watts at a distance of about thirty centimetres. Now with both hands free the sample can be examined with a wide magnifying glass while holding a pooter ready. Specimens will start to move within seconds or, at the most, a minute or two and after about ten minutes anything present is very likely to have been spotted. Look out for specimens taking flight and have a supply of tubes and bungs ready for the pooter, a receptacle for the debris will also be needed so that it can be returned to the field. In this way many samples can be examined relatively quickly. If anything special is expected the berlese extractor should be used or examine the sample under a stereoscope at x10 just in case. Similar samples can be obtained in the field using a rechargeable hand held hoover; these can be emptied into a bag and treated in the same way. There are a couple of methods that may be used to obtain excellent results but, without constant supervision, these are not really suitable for sites to which the public have access. Firstly aerial or mist netting consists simply of setting out a fine net at some likely looking place in a wooded area e.g. across a clearing between trees, and leaving it to see what turns up. The higher and wider the net the better, and some form of collecting device is necessary, generally a plastic channel containing a dilute detergent is placed along the base of the net to retain specimens that hit the net and fall. Obviously the longer it can be left out, day and night, the better. Many species occur in these devices and for some groups e.g. Leiodidae they are probably essential. A suitably situated garden would be ideal for this. Nets can be obtained from B&S Entomological Supplies (Marris House Nets). Another method which may be very productive is sleeving but as these may need to be left in situ for a long time the chances of them remaining untouched in a public place are probably small. Likely looking, i.e. damaged or fungus infected or those with emergence holes in, twigs and small branches are enclosed in a sleeve and examined on a regular basis. Many species emerge in the early spring and so winter is a good time to apply the sleeves, at this time the wood will be much easier to examine as there are, in most cases, no leaves. Awkward branches may be cut to fit into the sleeve and for this reason a small pruning saw should be carried. They may look a little bizarre but the most readily available and best sleeves are those made from cut down stockings, being nylon they will not readily decay. Again, an ideal method for a domestic garden. 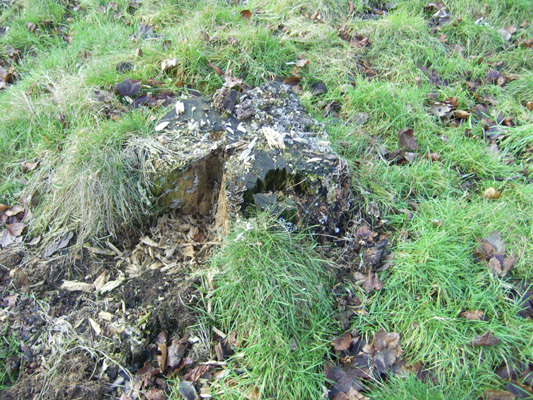 Pitfall traps can be placed around or under logs and trunks but with a little imagination may be placed in rot holes or simply wedged into crevices, when beetles are active they end up in all sorts of places. A drop of dilute detergent will retain the specimens in good condition. A tempting and very productive method may be employed but it should be realised that its potential for destruction is great and this is the use of insecticidal sticky traps of the Vapona type. These may be attached to likely looking trunks etc. or may be hoisted high up into trees on threads and they work very well but are indiscriminate and will kill insects of all kinds and will continue to do so for some time. They can be difficult to handle although nowadays there are some very convenient designs available, and a solvent will need to be found in order to remove the trapped insects. Once placed they will go on killing day and night, as of course will any static sampling method, but these things can produce enormous, and usually pointless, samples and so their use should be carefully considered and they should be monitored very closely. Likely samples of wood can be removed neatly with a saw and brought back to be stored in jars or sealed bags in a shed and examined frequently to see what has emerged. These samples should be cleaned up before storage as it will be difficult to see specimens in a bag containing e.g. soil or moss and wood fragments from a sample taken at ground level from a rotten stump. Such samples should be examined daily once the weather begins to warm up. Each container should be labelled with the date of collection and provenance as well as the species of wood and any ecological information available. Once a sample has run its course it should be returned to its place of origin. Many species are attracted to the mixture of visible and ultra violet light emitted by mercury vapour bulbs and these are usefully run in any situation. We have had very good results with a 125 watt discharge lamp run next to a vertical white sheet in a wide variety of situations, very often species turn up that will not be found using other methods. A generator will be needed and the lamp and control gear should be bought from an entomological supplier but shop around because prices vary, at the 2008 AES exhibition we found lamps on sale for �4. Other types of light are not so good but during warm nights in May and June, probably the best time for light trapping, any lights are worth running; a filament bulb of 100w against a white garden wall has produced good results for us, various small fluorescent tubes, some boasting u.v. emissions, have proved useless in our domestic garden situations. Many other methods of obtaining specimens from wood will no doubt be developed, when out in the field looking at timber etc. ideas for sampling seem to come naturally, which is to say that a guide such as this may be useful but to appreciate the possibilities one really needs to get out and have a look; environments in and around timber are very varied and each sample will need to be treated individually, there is no Straightforward way to treat all samples. We have mentioned sugaring but other things may usefully be used as bait e.g. samples of fruit or mushrooms or something very pungent like fish could be left in rot holes or crevices, the possibilities are endless and should something be found to work well it would be worth communicating. Malaise traps are easily obtained but suffer from the same problems as netting or sleeves, being thus impractical they are outside the scope of this discussion but they can be very productive and, for those very keen individuals, are worth looking into. Having emphasized the need to take a flexible and varied approach to finding saproxylic beetles we now discuss a method of finding beetles that should be applied to almost all of the types of situations mentioned so far. Berlese extraction is a simple but very powerful method of finding beetles, not only from wood but from just about any situation. A berlese funnel or extractor is a device which allows a sample to be exposed to light and heat so that the fauna within will want to escape and, after having done so, the specimens are funnelled into a collector which is simply a bowl or beaker containing dilute detergent. Specimens are then ready for examination. These devices are very efficient for extracting specimens from loose samples e.g. leaf litter, soil or moss etc. For larvae living within wood they will not work and might even cook the occupants and so some common sense needs to be applied; if a sample of wood is thought to contain larvae or pupae then it is better to remove any debris for examination and then leave it in a jar or bag and keep an eye on it. For the coleopterist, a berlese funnel is much like a moth trap to the lepidopterist, it allows us to sample an area much more thoroughly than most other methods e.g. sieving a mixed sample of moss, fungi and wood fragments will reduce it in volume and will present us with a sample to examine but we cannot be sure that specimens within fragments of the original sample have been exposed and, short of examining the whole thing under a microscope, we can never know what proportion of the fauna has been separated. The extractor is more subtle and much more efficient, various models are available commercially but they are expensive and, as we have use of both a commercial and a home made model and have had the opportunity to compare performances, we have thought it useful to outline the construction of a simple design which is comparable to commercial models but only about a quarter of the price. A low power light bulb, we use 15 or 25 watts, is best for the extractor so that the sample is warmed evenly and gently and the inhabitants have a good chance of escaping. Although most insects will climb the walls of a container in order to escape, in the extractor the majority will have left a dark environment and, in order to avoid the overhead light, will go down into the funnel and end up in the liquid. The time needed to extract a sample depends, in our experience, upon how damp it is. A wet and dense sample will take longer because, rather than warm up, it will remain at a more or less constant temperature until the moisture has evaporated. Thus a dry fungus sample might be fully extracted in a couple of hours while a mixture of rotten wood and debris from a rot hole might take twenty four hours or more. Experience will soon show how long to leave a sample e.g. if the heart of a sample is still damp after a day or so then it can be pulled apart a little and returned for a while until dry and, presumably, evacuated. Apart from delaying the next sample for a while no harm is done and the potential for finding something is always real. Soft and crumbly or damp heartwood and debris from inside holes along trunks and branches. Samples of wood infested with fungi, especially those supporting fruiting bodies. 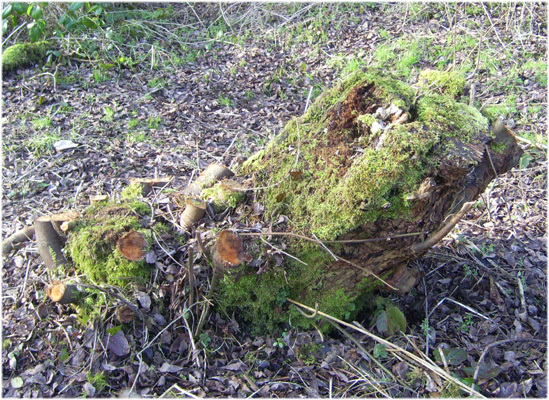 Samples of deep moss from on top of or around logs, especially where these are situated on wood borders or in open parkland. Samples of dead bark, especially when these are situated near living bark and you can include debris from beneath. Grass tussocks and associated loose or compacted vegetation from around the base of unhealthy and fallen timber. Underground samples from around dead roots, especially if these are hosting fungi. Bird and insect nests, more especially if they can be sampled as soon as they are empty. Beyond these anything that seems like a good idea probably is a good idea. As a general rule trees and timber on the edges of wooded areas, those standing in small groups or alone in parkland, gardens or along river margins etc. will be more productive than those whose trunks are in permanent summer shade and so seldom warmed by the sun.